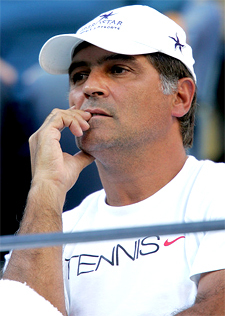 Excerpted from "Strokes of Genius"
Toni Nadal: Philosopher, ping pong champion, gardener, coach. 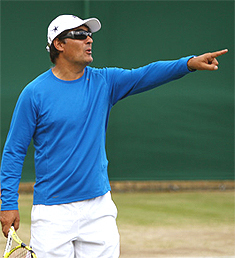 Toni Nadal, the cerebral Nadal brother with a fierce non-conformist streak, was a Balearic Islands Ping Pong champion and a fine tennis player. Toni had too many other interests--history, philosophy, gardening, friends, day-to-day curiosity--to devote himself fully to the sport, but he achieved a top-30 ranking in Spain and played cagey, tactical tennis at the level of, say, a strong college player in the United States. 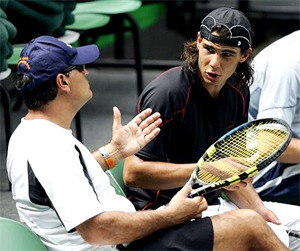 When Rafa was three or four (accounts vary, and the subject himself pleads ignorance), Uncle Toni, then a pro at the local tennis club, equipped him with a racket. With shaggy hair moving with each stroke and a complexion matching that of the nitrate-colored clay underfoot, Rafa used his entire body to bat the ball over the net. Toni was struck by his nephew's organic talent. Like a kid fiercely scribbling in a coloring book yet managing to stay inside the lines, Rafa could slug the ball with accuracy. But Toni was "probably more impressed," he says, with the kid's intensity. When Rafa was on the court, time became elastic. "Other boys, even much older, would hit the ball around and then get bored. Rafa would play and play until he was satisfied. Without anyone telling him, he would work on his weaknesses," says Toni. "Always, always, he had this discipline." From the beginning Toni established certain rules. 1. "If you ever throw a racket, we're finished. They're expensive, and when you throw a racket you don't just disrespect the sport, you disrespect all the people who can't afford equipment." 2. "Losing is part of competing. You will lose. And when you lose, it's not going to be my fault or the fault of your, racket or the balls or the courts or the weather. It is your fault, and you will accept it. Too many people in this world make excuses for their problems. You take responsibility and try and do better next time. That's all." 3. "Have fun. When you stop enjoying this, it's no good. You'll find something else that gives you pleasure." Toni shaped Rafa's game and his personality as well. Quietly, Toni reckoned that his nephew was a potential adult champion. Less quietly, the Spanish Tennis Federation began inquiring about the kid. Might he like to leave his picturesque island and train at a national academy? Might he like to leave the comforts of his anonymous uncle and receive guidance from a big-name coach? The Nadal clan held an informal summit, not hard given that most of them lived in the same apartment building near Manacor's main square, each family inhabiting its own floor. In addition to teaching tennis, Toni was at the time a partner with Sebastian in the family business. The brothers quickly reached an agreement: Toni would keep his share of the business. But instead of working in the office, he would make training Rafael his full-time job. Child psychologists often say that every adolescent male needs an adult to help him grow up, and it can't be a father. In Nadal's case, this was clearly his uncle, a mystical figure who shaped the kid's tennis game and his core identity in equal measure. Tennis came easy to Rafael. Toni was there to make sure that nothing else did. He would make his nephew practice with dead balls and on pocked courts that gave dishonest bounces. Rafa would finish a practice and then, under his uncle's orders, sweep the clay court himself, a job usually left to low-paid attendants. Says Toni: "Just because you excel at hitting a tennis ball, that makes you no better or worse than anyone else." As a teenager, Rafael was given free shoes by Nike and Reebok, both of them vying for his endorsement. The first time Toni caught Rafael bending the heel and wriggling his foot into the shoes, he scolded, "You untie them and put them on properly and show respect. They may not cost you anything, but that doesn't mean they're not expensive." Tennis says yes to Rafa, but Toni says no. Leavening every victory with perspective, Toni compared success to shooting a gun. Even when you hit the target, there's that unpleasant recoil. "Everything positive in life," he says, "also has a negative side. That's why you shouldn't get too high or too low." When Rafael began winning, Sebastian suggested that his son start to pay for his coach from his own winnings and endorsement income. Toni rejected the idea immediately. Hell, he wasn't going to let any teenager sign his checks. "I don't want to receive money from Rafa because I want to be the boss," he says. "When I'm in business with the father, I don't need money from the boy. When the boy pays, I'm working for him, and that's not normal." The boss and ready to go when he goes. "When I go, I go," says Toni. "Maybe tomorrow we decide to go apart. If that's what Rafa would want, it would be fine with me. I'd be with my family and my garden." 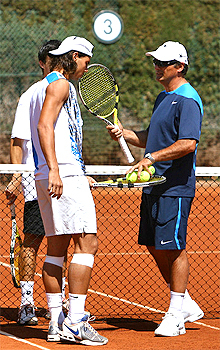 On those rare instances when he's cosseted or given special dispensation, Uncle Toni is there to put him in his place. It drives Toni crazy. They go to Disneyland and they're told they can cut all the lines. They play golf and they're told they can feel free to drive their cart on the fairway. They go out for a bite to eat and they're told, thanks, but the meal is on the house. They go to the doctor and Nadal jumps to the front of the line. "It's not normal, everyone always telling you 'Yes, yes, yes,'" says Toni. "I am here to tell him 'No!' I'm here to challenge him to always say the opposite." When Nadal defended his French Open title in 2006, he was scheduled to play the Queen's Club event in London, a grass court tune-up that begins the day after the Roland Garros final. Worried that Nadal might be so exhausted that he'd lavish himself with a week off, the Queen's Club tournament director offered to charter a helicopter to shuttle Nadal from Paris to London. Cool, thought Nadal, who'd never considered pulling out of Queen's anyway. Not cool, thought his uncle Toni. 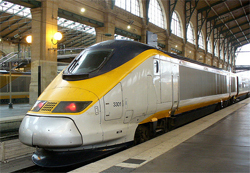 They had already booked their tickets on the Eurostar, the high-speed train that runs from Paris to London under the English Channel. "We're not wasting that money," Toni said flatly. They declined the private helicopter and took the train. For Nadal and his camp, the Eurostar ride from Paris to London had hardened into ritual. Helicopter or no, Toni never wastes EuroStar tickets. So the day after winning his fourth French Open, Nadal trudged through the Gare du Nord alongside the other commuters and businessmen. He posed for a few photos and signed some autographs, but otherwise he was just another independent contractor heading off on a Monday morning to do some business in London. Not that Nadal rebels against these methods-como se dice "old school"?-or against the uncle who treats him like a mortal, not a demigod. "He is always going to be my uncle, and family is first," Rafa says. ''And I am disciplined like him too, so I know where he's coming from." To Toni it all illustrated a cosmic truth in life: gain and loss are not symmetrical. To him, every action does not have an equal and opposite reaction. "Victory does not feel so good as losing feels bad," he says. "When you have a son, you are happy. But it's no comparison to the sadness you feel losing a son. When you earn one million dollars, you are happy. But when you lose one million dollars, it hurts more. If Rafa wins Wimbledon, he's happy, we're all happy. But what if he loses?" Toni remembered how, after the 2007 final, he walked into the locker room to see Rafa slouched in front of his locker, crying. "Don't cry," Toni said sternly. "Crying because you don't win Wimbledon? It's like if I cry because I don't have a Rolls-Royce." L. Jon Wertheim is a former junior tennis player and Yale history major who went on to a career as one of the most creative and distinguished sports writers in the world. He is a senior writer for Sports Illustrated, and the author of five works of non-fiction, dealing with topics ranging from the rise of cage fighting to the story of a bipolar pool hustler named Kid Delicious. "Strokes of Genius: Federer, Nadal and the Greatest Match Ever Played" is his most recent book, released in June of 2009. In his new book, destined to become a classic in tennis literature, Sports Illustrated writer Jon Wertheim tells the epic story of the Wimbledon 2008 final, and how Rafael Nadal dethroned Roger Federer as darkness descended in the fifth set of a match lasting almost 7 hours. More than a set by set and at times point by point chronicle, this book seamlessly interweaves the life stories of these two great players and their families, combining the perceptions of media observers, other players, officials, and average tennis fans around the world.